Happy New Year! Thank you for visiting! New year, new goals. With the busy holiday season behind us, it's a great time to set some goals for 2107. I feel a little like I could just move all my 2016 goals to my new list. It seems that 2016 didn't really go as planned. It was an emotionally hard year for a variety of reasons. I think I let a lot of things go in my life in favor of sewing. But I did sew a lot. In addition to bee blocks and progress on new and existing projects I think I finished twenty-one quilts (most of those mini quilts or baby quilts), including those I helped my kiddos finish. That also includes my daughter's first two quilts. We're now a family of three quilters. :-) I've spent a lot of time thinking about my intentions as 2016 came to a close: for my quilting, my blog, and my life. Tips and Tutorials. I'd like to work on the education angle of my blog. I was a teacher for eleven years before having kids. People often ask me if I miss teaching. There are certainly aspects I miss about the job, but there are so many ways that I teach on a regular basis. (My kids are four and six... plenty of teaching opportunities there.) 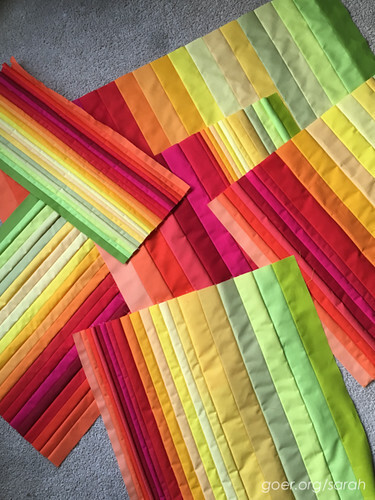 I see pattern writing and my blog as ways I can still use those teaching skills coupled with my passion for quilting (and math!). Posted in Quilting. Tags: goals on January 1, 2017 by sarah. Good luck on your newsletter!! Thank you, Bo! Happy New Year! It sounds like you have great plans for 2017, and I think the All People Quilt UFO Challenge is going to have a lot of great community support for the year. I look forward to seeing your quilting (and your kids!) continue to grow this year. Thank you, Yvonne. I've seen the UFO challenge around for the past couple years, but it seems to be bigger this year. Happy New Year! You are a natural teacher; I learn a lot from you in many ways! May 2017 bring you and your family only the best of everything, especially good health. Would love together when we can all come up for air. That is so sweet of you to say, Robin. Thank you. Big wishes that 2017 is easier all around! Happy New Year! Sounds like this year promises to be a lot of fun! I'm especially intrigued by Color Strata and where you'll go with it. All the best to you in 2017! Next step: slice it up! I also have a pop of color for the background (in case you didn't think it was loud enough yet! ;-)). It's top of the priority list next week. :-) Thanks for visiting, Michelle. Here's to another exciting year of quilting adventures! These are great goals. Looking forward to your pattern and newsletter.